It is a beautiful early Sunday morning in Copenhagen! I've just finished breakfast (more yummy Danish!) and am ready to recount the events of yesterday. Saturday morning was equally as lovely as was Friday, and I set out at a bit before 10 am for the train station. I caught a train immediately for Helsingor and was there in 45 minutes. 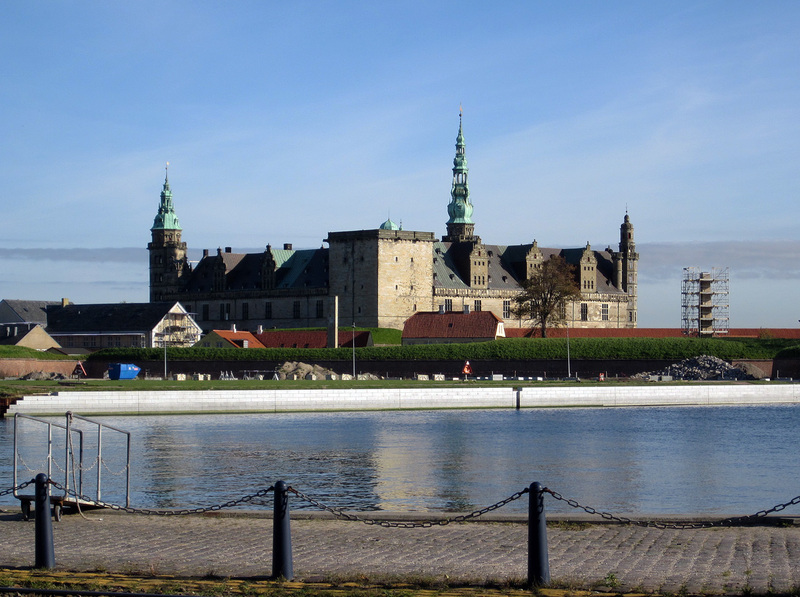 Kronborg Slot (the Hamlet castle) opened at 11, so I had time to stroll through this lovely seaside city of tiny streets and brightly colored houses. I've noticed that there are a lot of steep red-tiled roofs, on housese here, and that for outer walls the Danes are attracted to a mustard yellow, sometimes a sea or sky blue, which combination makes for bright and cheerful-looking blocks of buildings in Copenhagen and in Helsingor as well as in the towns we sped through on the rail journey from one place to the other. 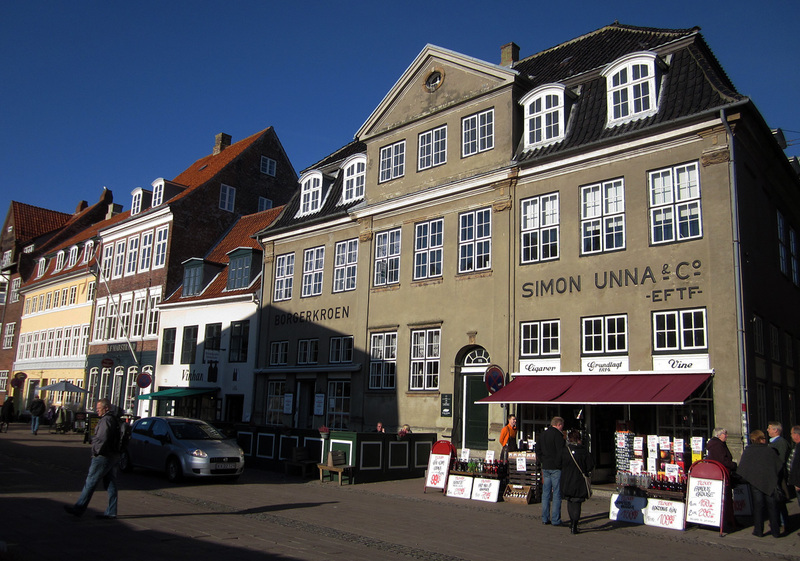 In each of these cities the brightly colored houses surround churches, many of course in Copenhagen, more than one in Helsingor, though one central spire definitely dominates. Helsingor is among other things a very touristy town. Shop after shop had merchandise displayed on the street, cafes and restaurants offered all sorts of food and drink, and an unusually large number of wine/liquor/beer stores sold their wares for apparently very reasonable prices. I connected the dots on this last observation as I recalled a comment from one on-line source in my research of the city. 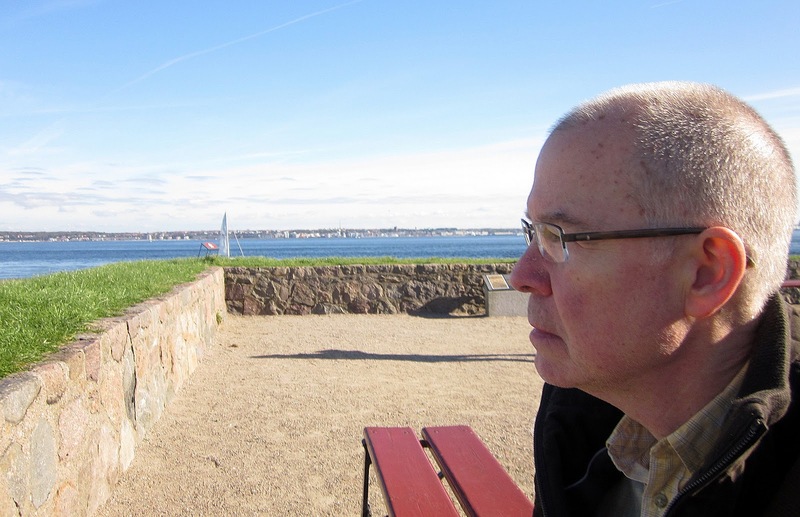 It was a note on the ferry from Sweden, which is JUST across the water from Denmark, a twenty minute ride away. In the note readers are warned to beware of drunken Swedes, who make the trip in droves to take advantage of much cheaper prices for alcohol in Denmark than is available in their own country.O my very short walk I must have passed at least five or six of these establishments and I watched as cases of beer and other booty were carted away from each! Does that make Denmark the bargain basement of Scandinavia? Probably just as well that I cancelled Sweden and Norway on this trip, though I still regret it. After a very pleasant stroll I headed for the castle, set on a spit of land just next to the sea, and visible as soon as I walked out of the train station. It's a dramatic sight, fit for the the likes of Hamlet, Ophelia and the rest of the characters in the play. And the period is right. The version of the castle we see today was built in the 1580s, just as, in a country not too far distant Shakespeare was embarking on his career in London. 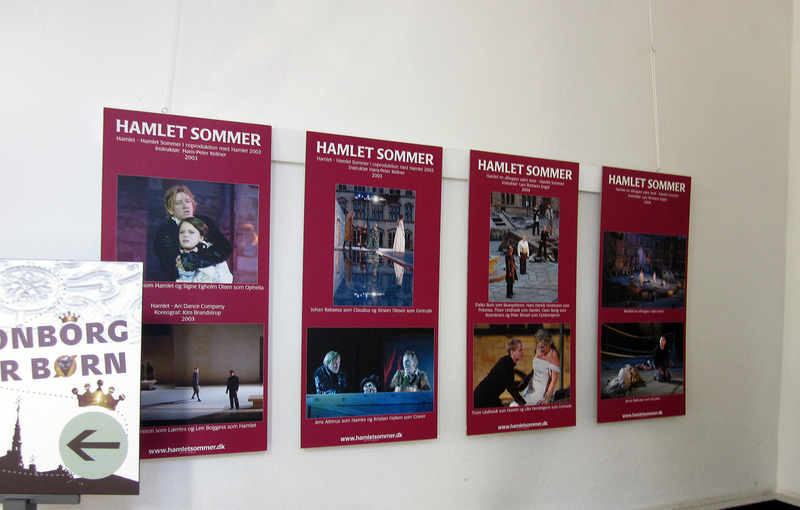 But at the castle, the play is NOT the thing. 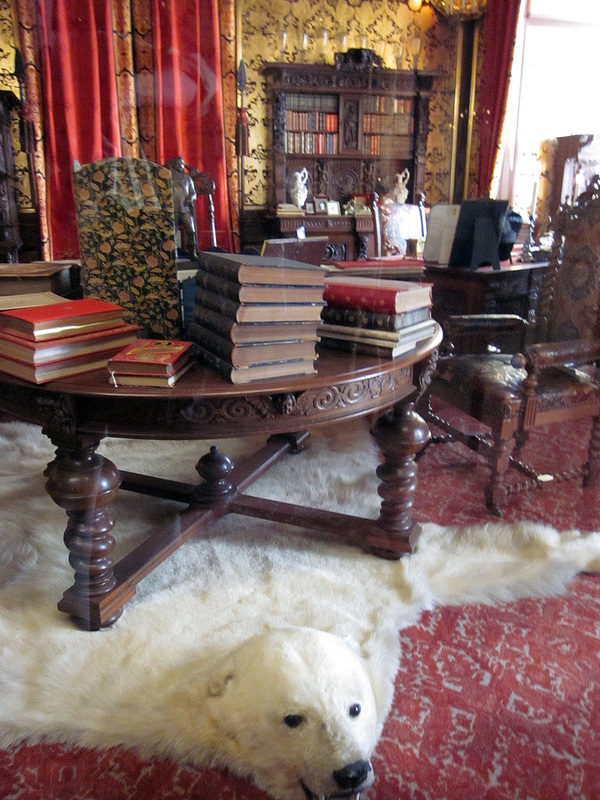 Instead the focus is on the history of the castle and the kings and courtiers that inhabited. It's a tale very well told. In the second room one comes upon in the preferred route for touring, there is a dramatic film, on three sides of a tiny alcove, of the great fire of 1629, if I remember correctly, which destroyed much of the castle. The feeling is that of being caught in the fire yourself. A few rooms after that, in the great hall, there are three tiny stage sets set one next to another in a large rectangular box, in which, one set at a time, holographs of dancers and courtiers, even the court dwarf and a dog, "enact" three different kinds of dances and other entertainments that might have cheered up a wintry night at Kronborg, each accompanied by Renaissance music. Farther along the self-guided tour a room with three great globes offers another sound and light show focusing on astronomical observations -- cast upon the wall are images of the path of the sun and the planets. "The ambassadors from Norway, my good lord, are joyfully return'd..."
"Now, mother, what's the matter?" "'Tis now the very witching time of night..."
"Now might I do it pat, now he is praying..."
"The actors are come hither my lord..."
Just a few of the phrases that popped into the good doctor's head as he moved about Kronborg Slot. You'll have your own, I'm certain, even you non-theatrical types! 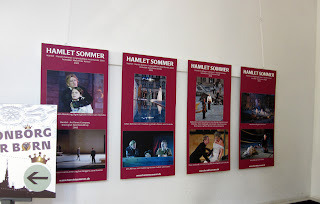 At very least the obvious, "To be or not to be..."
To repeat, only at the end, in the last few rooms, posters of summer performances of Hamlet in Helsingor are on view, and notes on the Bard explain the theatrical connection. 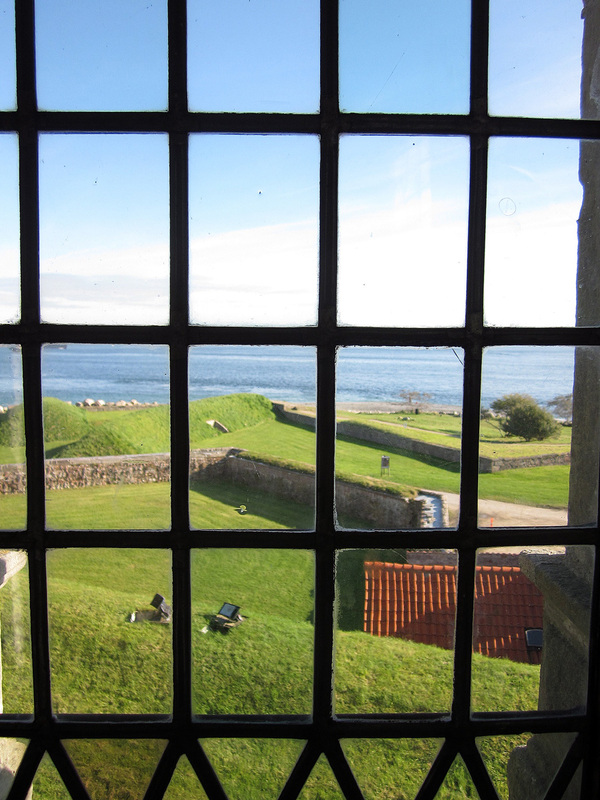 So 'tis a castle filled with Danish history as well as with theatrical resonances, well worth the visit for either reason, or both. 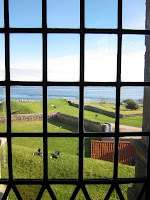 Or, on such a beautiful day, for a stroll outdoors, though the battlements (thought it's much too bright a day to imagine the two words that open the play: "Who's there?" spoken in the dead of night) that overlook the sea and just beyond, the coast of Sweden with its sister city of Helsingfors. Dottore Gianni: "To go, or not to go?" And indeed, many were doing just that. I sat on a bench in the sun and munched my lunch, contemplating a quick ferry ride across the short stretch of sea. 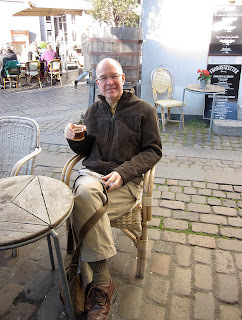 Thought the better of it as the day was flying by, and I had more business (well, pleasure) back in Copenhagen. After another stroll through town I happened to arrive back at the station just as a train back was due to pull out. I'm certain that if I were to stay longer I might become frustrated with a wait for train or bus, but thus far it seems that the instant I require public transportation it is ready to serve. 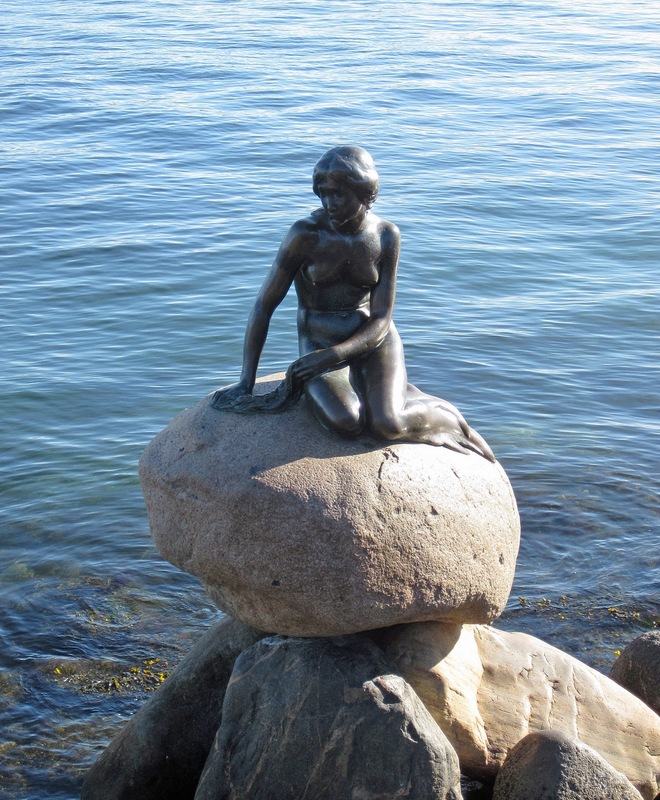 A series of coincidences, or do the Danes know how to travel? 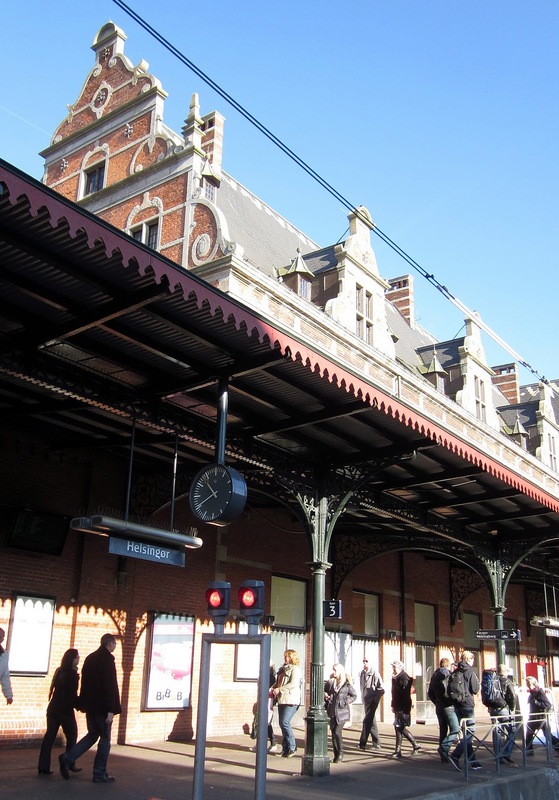 Albeit my acquaintance with Copenhagen was very brief, I felt emboldened to get off at Osterport, in the north of the city, so that I could see some of the places I'd not yet seen, and while doing so gradually make my way back to my own tawdry neighborhood. And I was able, with only the slightest of false starts, to find the large, beautiful park called Kastellet, or The Castle, beyond which was the tourist mecca Den lille Havfrue, aka The Little Mermaid. This area had been crowded on Friday, but it was even more so now, tour buses depositing large groups for a quick photo opp. Somehow I managed to get my camera high enough for a decent snapshot, and then I managed to get myself out of the crush as quickly as possible. I was the only one who seemed in such a rush, as most were ogling away, young lovers kissing each other madly. Much ado about very little, in my opinion, though of course it's a major reminder of one of the great Danes, Hans Christian Andersen, so I should probably just shut up. I walked along the waterfront until I reached Amalienborg, the exquisite neoclassical royal residence. 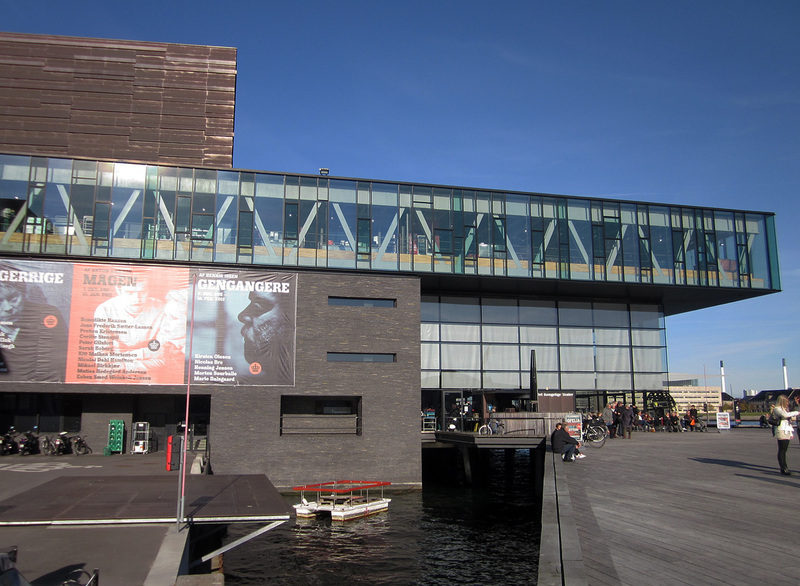 When you approach from the water the first thing you see is a beautiful fountain centered in front of four elegant buildings, and when you reach the very middle of that square and look back at the waterfront, you can see the Operaen across the waterway, through the cascading fountain. Beautiful planning, as it seems has occurred throughout much of Copenhagen. 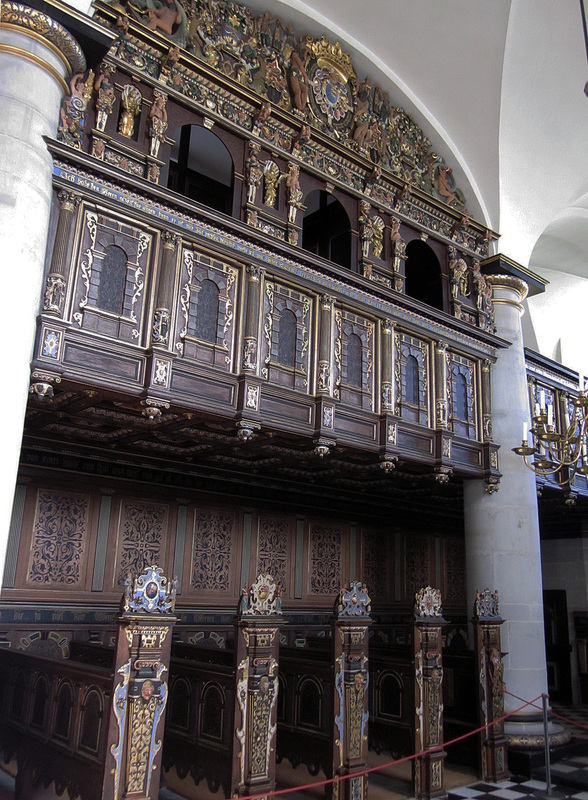 I used my Copenhagen Card again (it's printed COPENhagen, and rightly so, as it's a real money-saver) for free admission to see rooms of state from the past, and to show how the royalty and Christianity (of the Evangelical Lutheran brand) are closely tied together. 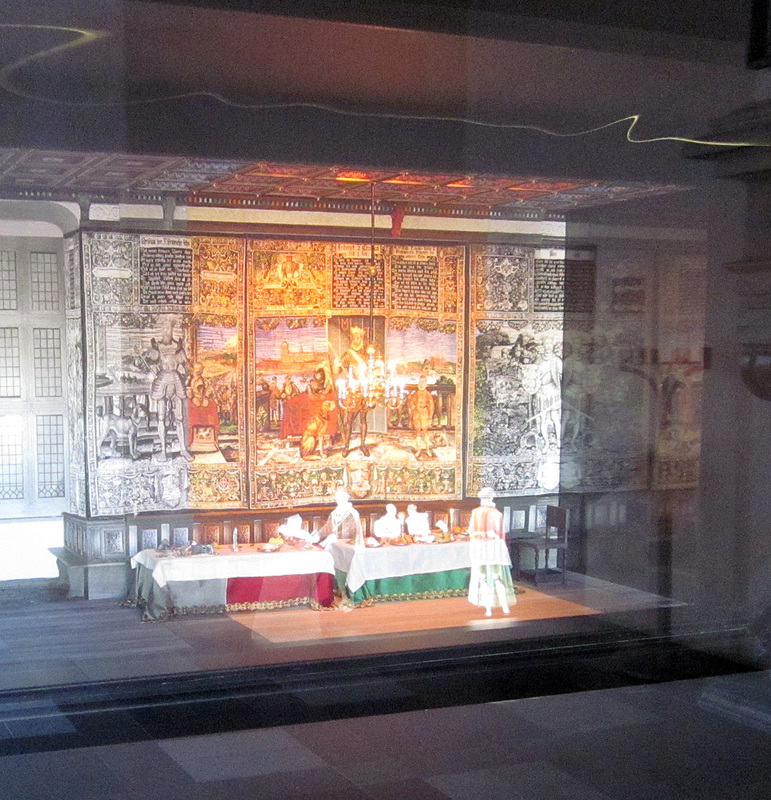 From Amalienborg I continued along the waterfront to Det Kongelige Teater, The Royal Theatre. 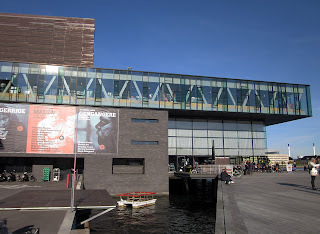 This is a spectacular new building, not the older Royal Theatre in the large central square called Kongens Nytorv farther inland, and looks across the waterway on an angle at the Operaen. I walked through the stunning lobby, which sits just above the water, jutting out as its own pier. A light refreshment area lies at one end of it, a more formal restaurant and bar at the other. You can order from the bar and take your drinks outside. I thought about doing just that, but the line to get drinks on this beautiful and I'm guessing unusual weekend in mid-October was very long, and there were no seats to be had outside anyway. By the way, above this level and are floor to ceiling glass windows, where actors dress, where costume and scene shop are situated, etc, etc; the architect's notion that those who work in the theatre should have the same lovely view as those who come to see the theatre. How fortunate then that just beyond the new Royal Theatre is Nyhavn, probably my very favorite section of the city. And judging by the masses of people strolling through and seated at a long line of restaurants, all with outdoor seating, I am not the only one who thinks so. 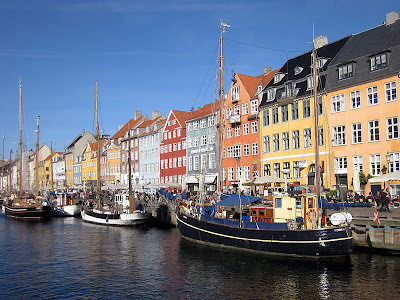 Nyhavn is set along a canal lined with sailboats, the buildings are painted in bright, cheery colors, and the sun pours over the northern side of the concourse -- what a spot for an unusually warm October day! I finally found a place that had a table to spare and slowly sipped a pint of Tuborg while watching people pass, envious, I'm certain, that I'd grabbed the spot that should have belonged to them. Nyhavn ends at Kongets Nytorv -- if you've been paying attention and not just looking at the photos, you'll remember that this is the large square that is home to, among many other buildings, the old Royal Theatre. It is also the entry point to Stroget, the long pedestrian street I wrote about on Friday, and the area I next plunged into, the final walk before heading back to my hotel. 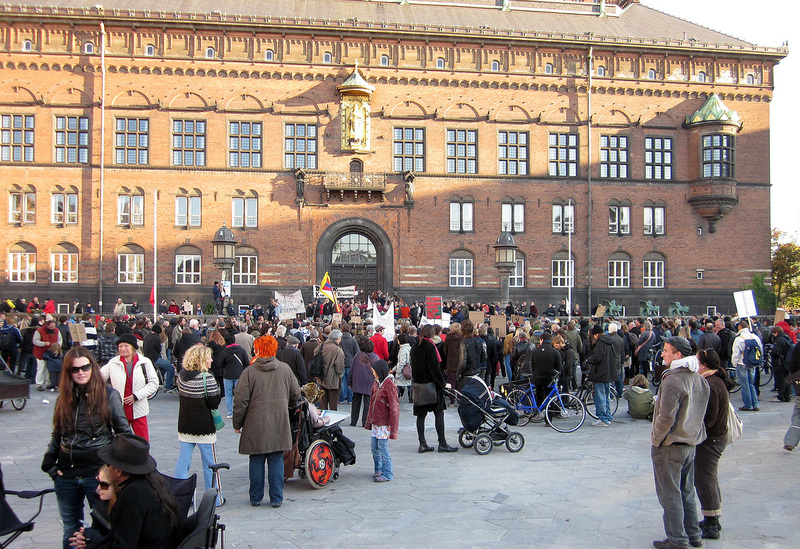 Stroget was packed on this weekend afternoon, almost too close for comfort, but I struggled through it and walked the entire length. The pedestrian zone ends at the Radhus, Copenhagen's Town Hall, which is next to Tivoli Gardens and so only a short distance from my hotel. 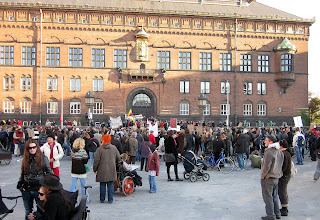 There was quite a commotion at the Radhus, and I realized that Copenhagen had joined cities all over Europe in that a protest was being held against their versions of Wall Street. This was not nearly as large as many reported. I'd say hundreds only, and it was non-violent, but very energetic. I watched for a while, but of course I speak no Danish, so while I got the bare gist, I decided it was high time to lie down for a nap in the hotel. I had after all started out before 10 am and it was now about 4:30 pm. Not as exhausting as Friday had been, but another whopper of a day. 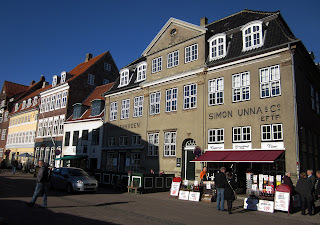 Enjoy the photos, plow through the text, and find out a bit more about a literally wonderful Copenhagen! One more installment to come!